I think we all have moments like this. As objectively cold as it sounds, it all boils down to our sense of familiarity and closeness. We can feel close to celebrities because we see them regularly and in many cases they spark feelings in us through a performance. At the same time we have no real response for people who are blood related but that we never see. because we lack that bond. you can develop a late bond through empathizing with those people that knew them and listening to old stories. But odds are you will not ever have the same deep connection others have. That’s just how the brain works. were a huge influence on my life but I felt no loss or sadness, just the sadness that comes from empathy at others who feel that loss. You might lose a loved pet one day and find you are more emotionally struck by that than the loss of an uncle or aunt. it’s all about how many connections, how recent they are and how much those connections affect you as a person. and no. those connections are never logical or make sense because they are created by your brain automatically as a partof information processing and memory storage so, you can feel grief and loss at the death of a perfect stranger if that stranger makes those connections with you. 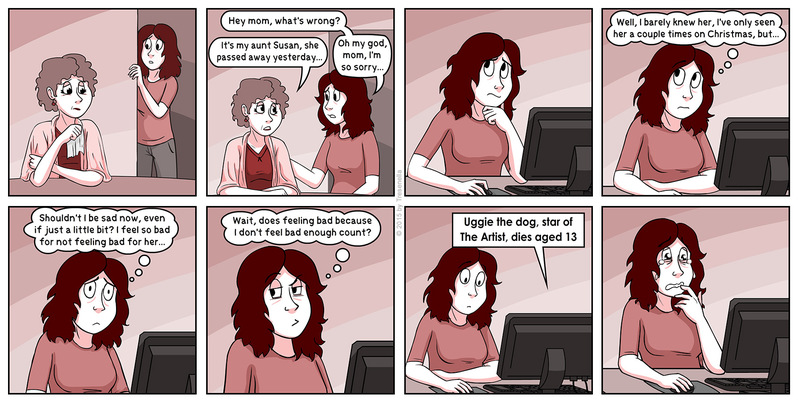 I just visited this site for the first time when the comic was linked to me. I like this web comic. but comments are hard to read, you should adjust your theme or change themes, or custom edit the html/css so that you can have a white background for the comments part, making them easier to read. I remember a very specific incident like this one… My grandpa died. The day before, my pet guinea pig had died. When I was told about my grandpa I just went upstairs and cried and cried… about my guinea pig.